NOCSAE develops athletic equipment performance and test standards. There are two categories of standards: general and sport-specific. General standards, such as ND001, ND021, and ND081 apply to all other sport specific standards. Sport specific standards are limited to the equipment in a specific sport. In addition, NOCSAE publishes guidelines which can be helpful to testing personnel, technicians, and manufacturers. Guides and guidelines are not a part of the standards and are not mandatory, but they do provide examples of testing and sampling procedures that would satisfy the requirements of the performance standards. Final Status: A Standard is elevated from Proposed Status by Board Approval and becomes effective no sooner than one year after vote for elevation. See the specific Standard for its effective date. Proposed Status (highlighted in red): A formalized document with Board approval for the purpose of obtaining written comments from manufacturers, governing bodies and other interested parties. Each standard is held in Proposed Status for a minimum one-year period. While in this status, the NOCSAE Board encourages all interested parties to provide comments. Comments must be submitted in writing to the Executive Director. Prior to submitting comments, interested parties are welcome to discuss their comments with either the Research Director or the Technical Advisor. A “revision” to an existing standard is defined as a change in a critical test or performance parameter which could affect pass/fail outcome, including, but not limited to, changes to any of the following provisions: headform, characteristics, drop heights/velocities, environmental conditions, anvil and/or impact surface characteristics, Severity Index (SI) limits, pass/fail criteria, number of impacts, impact location, and instrumentation. Implementation of a revision requires a 2/3 vote of the Standards Committee. Some confusion seems to exist with regard to the proper interpretation of the effective dates for standards that have been revised. For example, as of today’s date of April 2019, the current NOCSAE standard for football helmets is ND002-13m15 and this version will remain current until the end of November 2019. At that time, a revised version, ND002-17m19, will become effective. 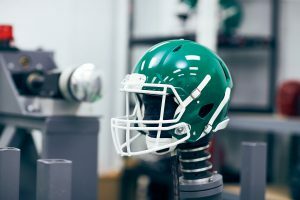 Until November 2019, football helmets currently being made or sold do not have to comply with the revised standard. A manufacturer can have models certified to the revised standard before November 2019, but it is not required to do so. When an existing standard is revised, the Standards Committee is required to provide an effective date for that revised standard. The primary purpose for an effective date is to specify when a licensee’s products must be in compliance with the revised version of the standard. Although it is permissible for a licensee’s new products to be certified in compliance before the effective date of the revised standard, new products do not have to be in compliance until on or after the effective date. The existence of a revised standard does not affect the certification of products already sold or in use. Following each document number (NDXXX-YYmZZ) is the year the document was last revised (YY). Revisions require NOCSAE Board approval. The year following the “m” is the year the document was last modified (ZZ or ZZa, etc.) Modifications do not require Board approval. A list of all modifications are provided at the end of the document.